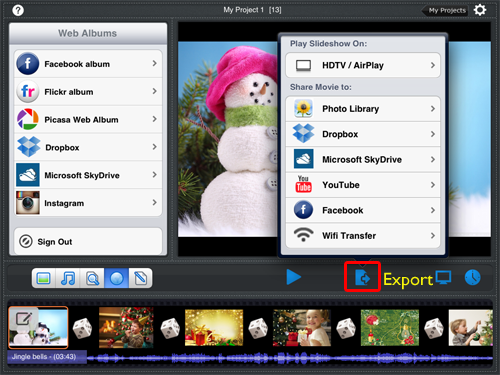 After customizing a slideshow, you can post it to YouTube for sharing with the world. 1. Tap Export icon and choose YouTub from Share Movie to list. 2. 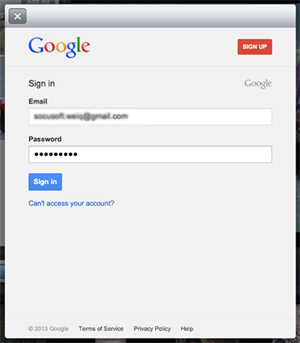 Enter your Google YouTube Email and Password, then tap Sign In. 3. In the Upload video window, type text in the Description and Title box for your slideshow. A slideshow with title and description can be easily searched. There are three resolutions for choosing: 360p, 540p and HD 720p. 720p HD video can showcase your photos in best quality, however it will take a longer time to upload to YouTube. You can set the slideshow viewing permission by taping Public, Unlisted or Provate. 4. Finally, tap Upload Now, the app will begin to encode the slideshow to video, and upload a video slideshow to YouTube with title and description.